2 x Stanton 500 AL II Cartridges & Stylus. Boxed. Condition of these items are very good/perfect. They had very little use, only a few hours, before they went in a draw, never to be used again. Unfortunately, as I took them out to check the condition, I clumsily knocked the stylus off one cartridge and stepped back to look where it went.... Yep, and stood on it!! Gutted. So, only one cartridge has a stylus now. Dispatched with Royal Mail 1st Class. Th er e lo ad s of l if e le ft In Th e ne ed le. A stylus is not included, but this a replaceable part and it is best to start with a new one. 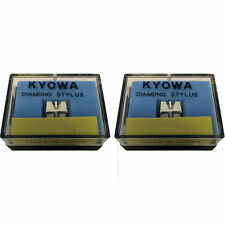 Replacement Pair of STANTON D500AL, D5107AL, D500AL MKII Record Styli Needles. D5107A, D5107AL, D5105AA, D500AL MKII. Order information. STANTON 500 MK III - TURNTABLE STYLUS ! STANTON 500 MK III . STANTON 500 MK III . We have for sale a 2x Soundlab DLP1R Professional belt driven DJ turntables. Soundlab DSM15 Mixer. WHAT U SEE ON THE PHOTOS IS WHAT U GET.